I love painted paneling. All of my homes have been older in years and each has had old dark wood paneling in at least one room. Painting it is the easiest trick to create an almost cottage feel and eradicate the 70’s vibe. 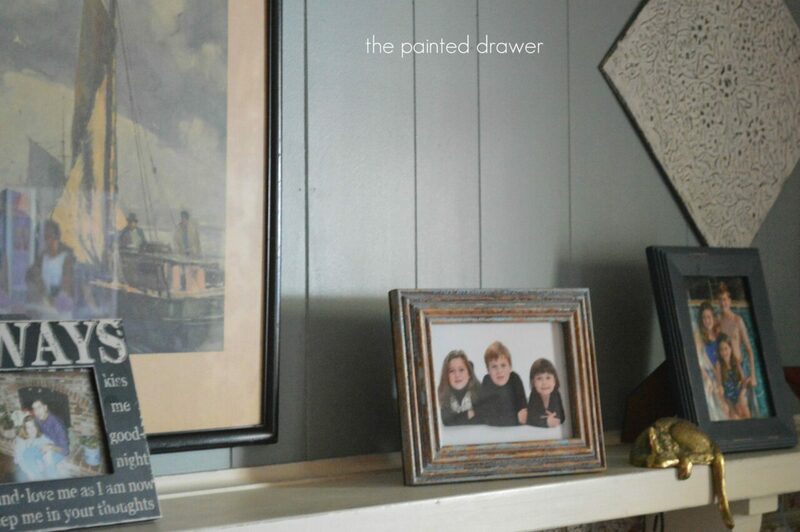 Our family room had dark paneling on top of the mantel. 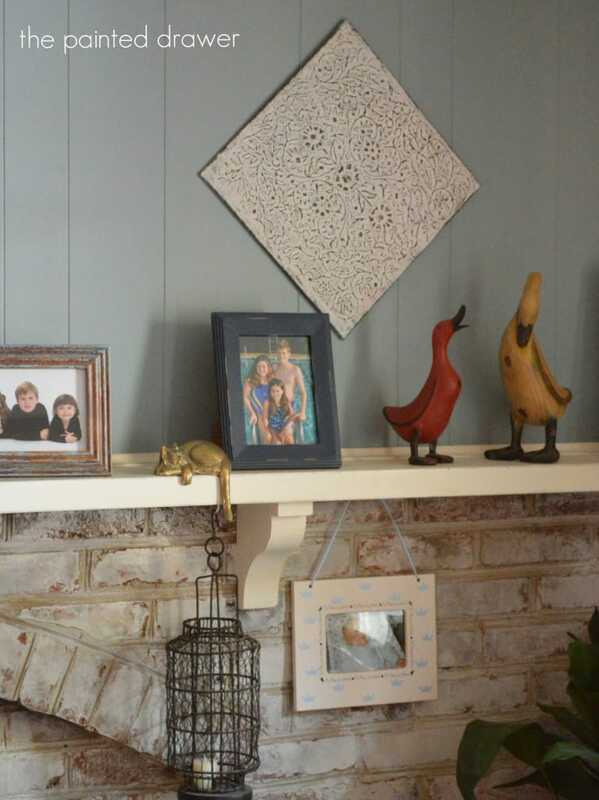 When I whitewashed my brick, I painted the paneling in an off-white color. 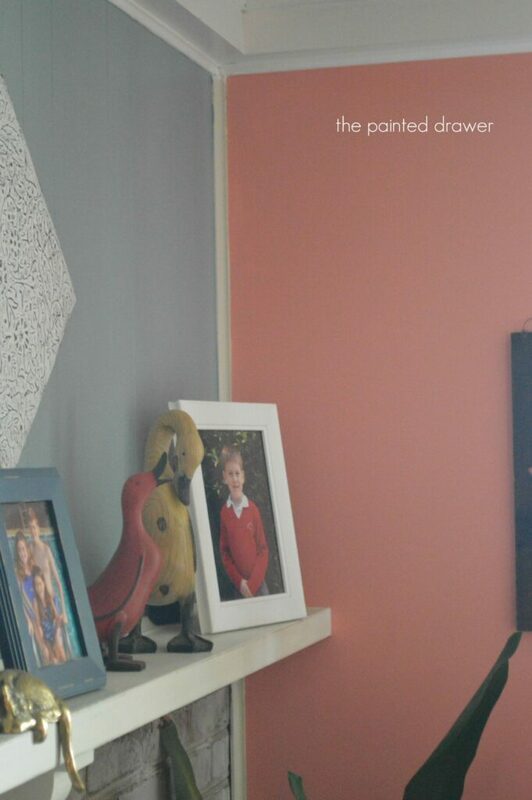 I recently painted the room in Benjamin Moore Passion Fruit and the creamy white just doesn’t look great against it. Last week, I took out my brush and applied a coat of General Finishes Persian Blue milk paint on the paneling and love it. 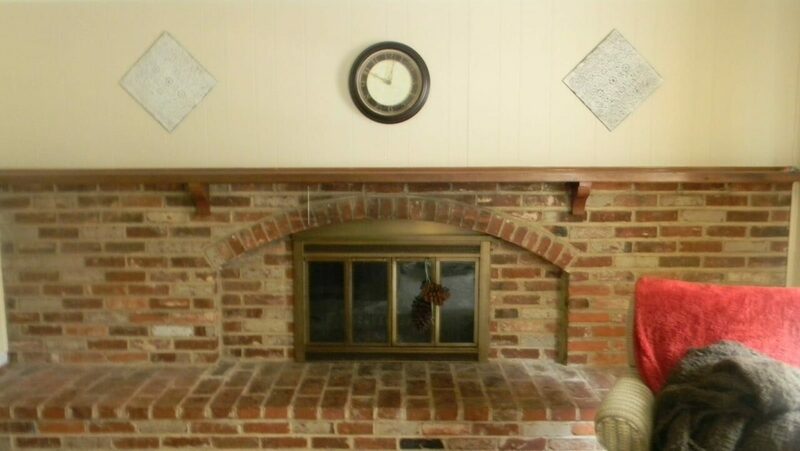 The color goes well with my whitewashed brick and looks great from the kitchen. However, it makes for a pretty bright transition with the bright Passion Fruit walls (that I only just painted!). Should I paint the whole room again in the blue? Any thoughts? Absolutely love the blue which I think would look really good on all the walls. 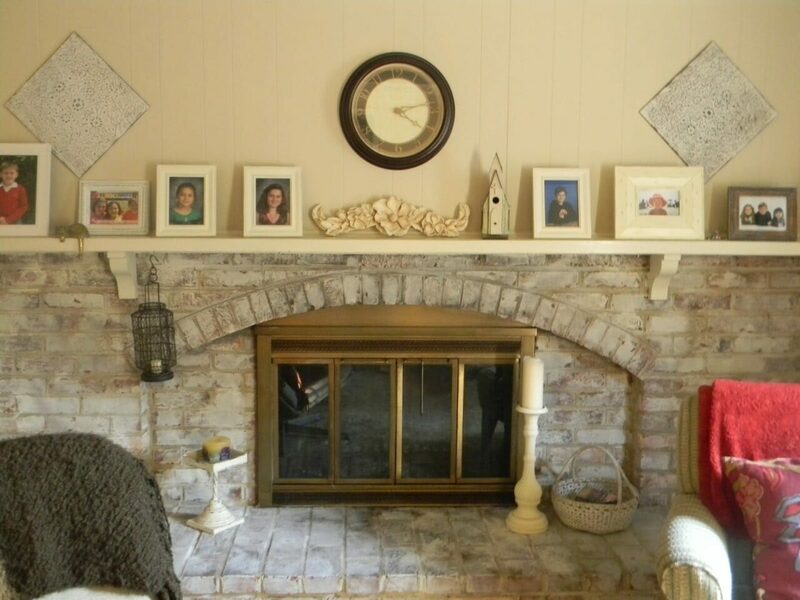 I also like the whitewashed brick fireplace….. I like the blue better. It looks more living room-ish. The fireplace wall is awesome. of paneling. I think blue in that whole room would be so relaxing…..with that great fireplace. 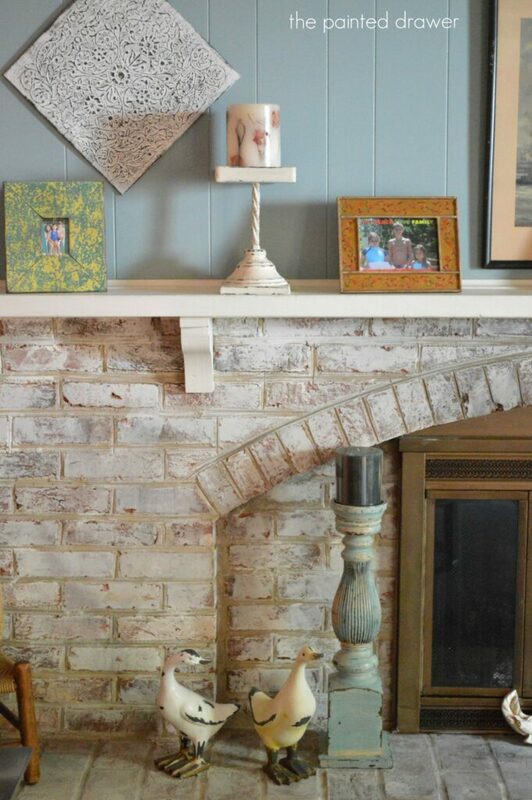 The blue looks awesome with your whitewashed fireplace! (That’s where I found you by the way — I was searching how to whitewash brick — still haven’t talked Hubby into letting me give it a go!) 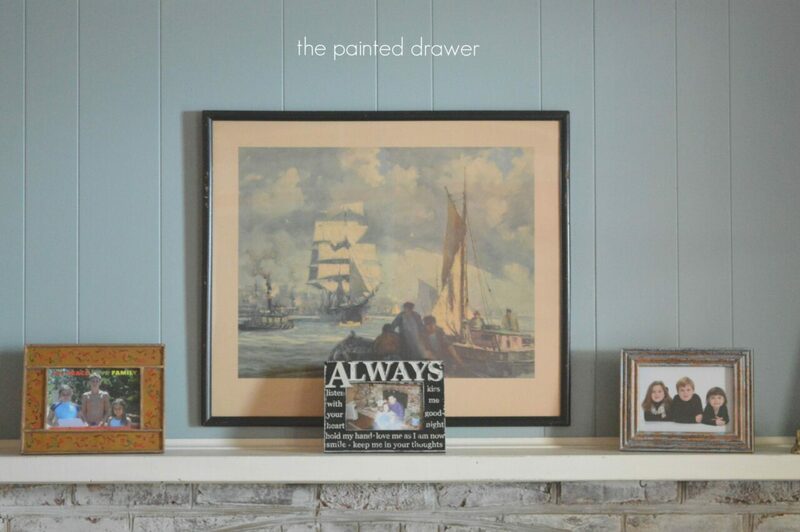 I’d paint all the walls, but maybe half as light as Persian Blue, then the fireplace would really stand out. Will you color match or actually use GF paint? I’m such a bogart with my good stuff — I keep it for furniture — although I will most likely use it to repaint my kitchen cabinets. Look forward to seeing what you decide! Hi – love the blue with your whitewashed fireplace and yes I would defo paint the rest of the walls in blue, but perhaps a couple of shades lighter? Yes, I love the blue. Hi Suzanne – here’s my thought. You have used blue so much in your home and it’s beautiful yet I understand you wanting to spice it up for the summer with Passion Fruit. 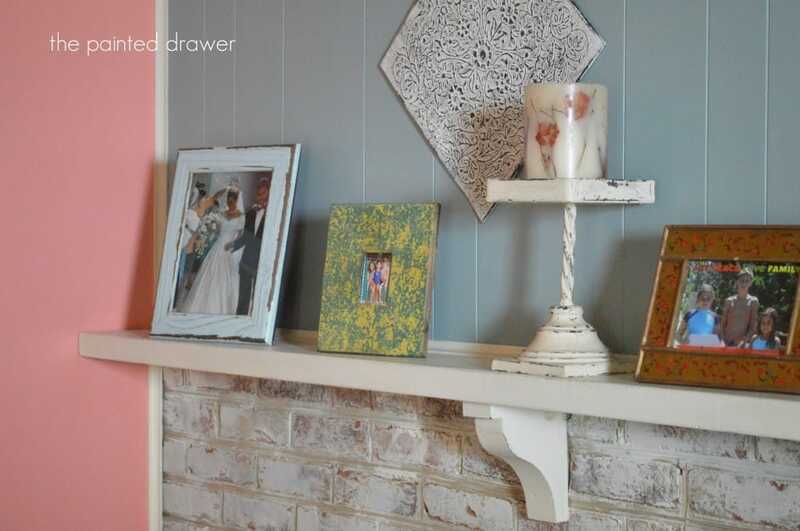 So why not try bringing the outside inside with painting the paneling above the fireplace a shade of green like Ben Moore Cypress Green or Ben Moore Lily Pad? I like the blue paint on the paneling mostly b/c it shows more definition as though it’s cottage bead board and I think a green color would do the same as well as compliment the rest of the room with passion! You can go back to Blue in the winter. If you like having a focal wall in blue, and the transition is to stark, l think you should paint the other walls in the passion fruit color. The look will be more subtle and relaxing! I agree with the ladies that said, blue, but the rest a shade lighter. Bring in the passion fruit and some fresh green in pillows. Your l/r is as charming as you are. I really love your suggestion, Cyn! Thanks so much! The blue looks wonderful! I think I would make the whole room blue. I totally agree with Cyn Benson!!! What she said!!! Agree with the last two comments. Very pretty. I agree with Cyn too. 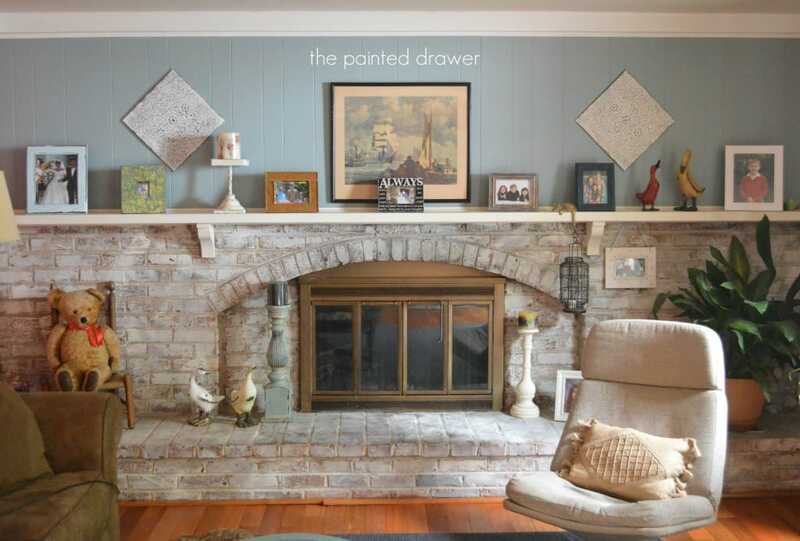 I really like the blue; but maybe a much lighter shade of it in the rest of the room so the fireplace wall stands out. Or, maybe an off-white that goes with the painted brick in the rest of the room that way you can bring in the brighter colors with pillows and change them with the seasons. I also really like this idea – giving the pop of color in the accessories. You are correct about painting paneling – it takes on a beadboard aura and is a drastic upgrade. Love your ideas ! I love this! Persian blue is such a calm color – perfect for a room like this. Thanks for sharing this! I love the Persian Blue above your whitewashed brick. I remember you painting the passion fruit not that long ago, but in all honesty I’m not feeling it with the Persian Blue. What about painting the other walls a white that has blue hues? Or a lighter shade of the Persian Blue? I am insane (certifiable) and am thinking of painting the whole room green (in the fall after kids are back at school). Cray-cray Suzanne is back lol!